Evacuating – Yesterday at noon, we set off for Jacksonville. What is normally a six-hour drive took us almost nine. We pulled up to Sid’s aunt’s house a little past 8:30 p.m. As I alluded to in yesterday’s blog post, it was the evacuation traffic that delayed us. The congestion was heaviest around Savannah. Although she had a rough final 45 minutes, Sloan did extremely well for most of the drive, smiling and laughing as we escaped Hurricane Florence. As we traveled away from the hurricane zone, we counted (yes, literally counted) over 300 linemen vehicles going the opposite way, right from where we were coming from. 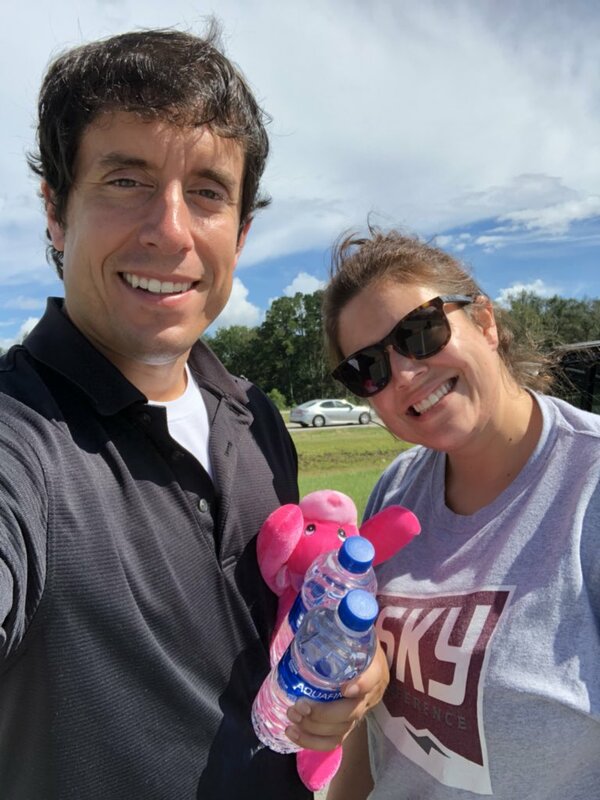 Sid and I at a random rest stop during our evacuation to Jacksonville yesterday. Current Outlook – The latest Hurricane Florence outlook isn’t as dire as it was yesterday. The storm has weakened a bit and the Myrtle Beach area can now expect less severe winds. Nonetheless, a HURRICANE is still going to hit the Grand Strand. What is supposed to really send our area into a frenzy of disarray is flooding. 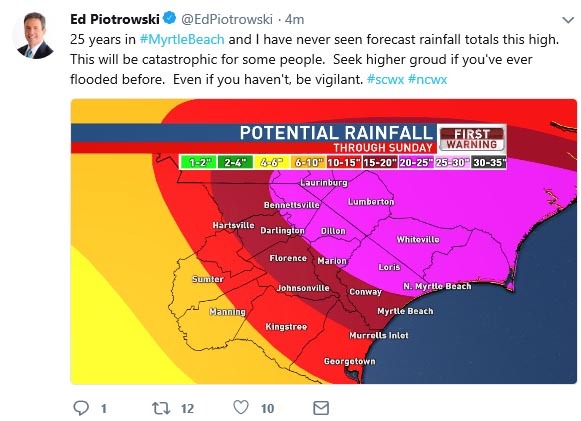 Massive rain totals and storm surge will combine to flood the South Carolina coast to a degree of biblical proportions. The wet conditions will soften soil, leading to further problems. Although the wind speed has decreased, gusts will still be strong and they will be sustained, lasting for at least 24 hours. Persistent, strong winds will wreak havoc on trees that are planted in the softened soil, leading to widespread vegetative damage. This flooding business is not going to be good. 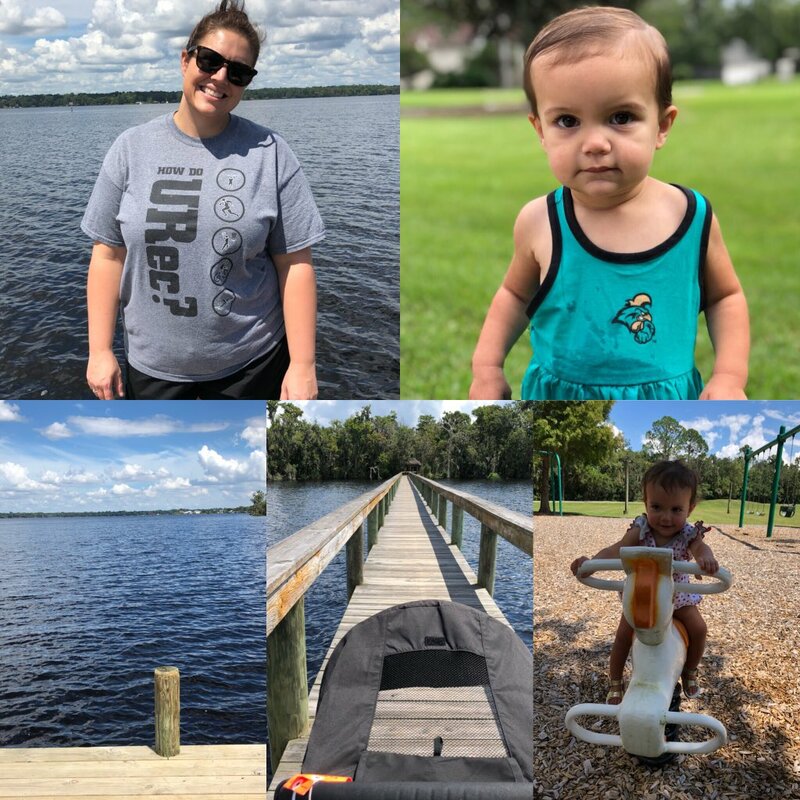 First Day in Jacksonville – It has been a relaxing, low-key first day in Florida. We are technically staying in a place called Fleming Island, a suburb of Jacksonville. After I finished my work this morning, the three of us took a drive around our new surroundings, scoping out the sights. We picked up some groceries and enjoyed lunch. A little later we went out on this long, skinny dock that overlooks a body of water called Doctors Lake. After enjoying the scenic view, we went to the playground in the community we are staying and let Sloan run wild. We are excited to see what the evening will hold! It has been a good first day in Jacksonville. Non-Hurricane Florence Topic – This week, the 35th season of “Jeopardy” debuted. It started off with quite the surprise as Alex Trebek trotted onto the stage with a beard! Although famous for the mustache he has sported over the course of numerous seasons, the beard was an entirely new thing. You know what? I like it!! 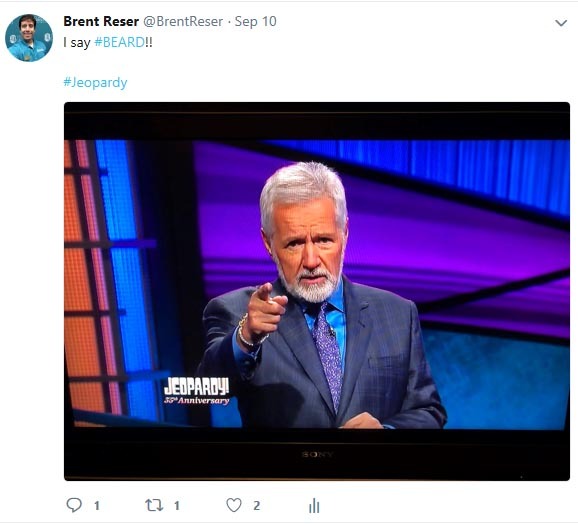 I am a fan of Alex Trebek’s beard! Tomorrow’s Surprise – Well, well, well, Sloan is in for a big surprise tomorrow. In order to give her a special experience and to take our minds off Hurricane Florence, we will be taking our little girl to a place that is quite popular in Florida. I can’t say much more than that, but if you don’t know what I am alluding to you must consider somewhere else the happiest place on earth. We are safe and sound, so don’t worry about us. However, please pray for the millions of people who are still in the path of Hurricane Florence. We can only hope that the storm will continue to weaken and that it will have mercy on the great East Coast. Don’t Blink.